Booking an all-inclusive can result in a very easy, worry-free vacation. 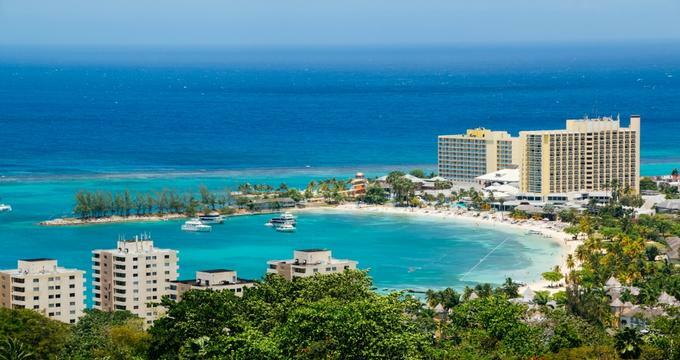 Jamaica has a plethora of all-inclusive results that take care of all of the vacation arrangements for you, leaving you to relax, soak in the surroundings, and enjoy all of the amenities and activities on offer. From exclusive couples-only resorts with clothing optional beaches to relaxed family-friendly resorts with waterslides and kids' clubs, Jamaica has something for everyone. Whether you are looking for something high class or a more laidback experience, there are resorts on this list for every type of traveler. 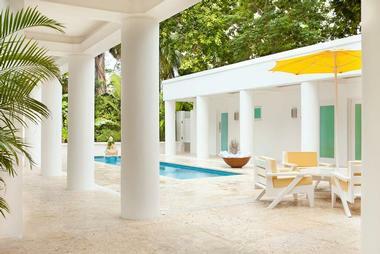 Peruse our picks and be inspired to book your next vacation in lovely Jamaica. 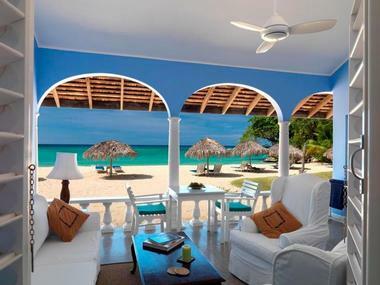 One of the more intimate properties on our list, Jamaica Inn is a small resort on a private white sand beach in Ocho Rios. The resort has a gorgeous open-air restaurant that serves Jamaican and international cuisine for three meals a day plus afternoon tea. There is also room service available if you’d prefer to stay indoors. The on-site Ocean Spa offers a full menu of luxury spa services to help you recharge and rejuvenate. This resort is not likely to be a top choice for someone looking for a party or night-life hot spot, but is a great option for visitors looking to enjoy a quiet getaway in a smaller, secluded resort. 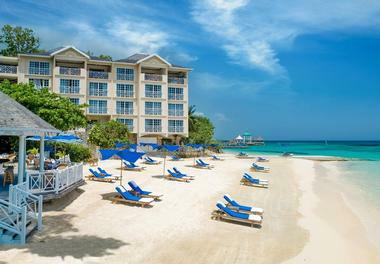 The Beaches Ocho Rios Resort and Golf Club is a large beachfront resort that is specially designed for families. 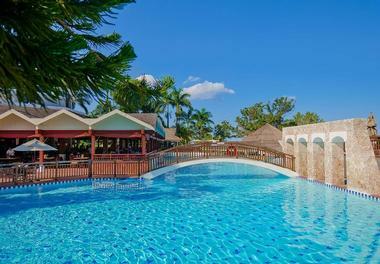 In fact, it is one of the most family-friendly resorts in Jamaica. Your tots will be delighted with Camp Sesame, a Sesame Street-themed kids club. Your older kids won’t be left out either, as the hotel has an XBOX garage for teens and older kids. There is a water park with fun for all ages and babysitting services to give mom and dad a chance to spend some time alone. 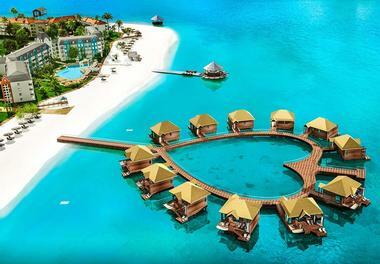 There are activities for adults as well such as scuba diving lessons, golf, an adults-only piano bar, and a luxury spa. There is truly something available for guests of all ages. One of the most romantic properties on our list, the Couples San Souci is located on 35 beautiful acres of beachfront property in Ocho Rios. The property features elegantly furnished, airy rooms that each come with private balconies. They have nice extra features, such iPod docks, designer toiletries, and flat-screen TVs in each room. There are two restaurants and six bars including a swim-up bar. As far as beaches go, you can choose from the private, clothing-optional, or traditional sides of the resort. 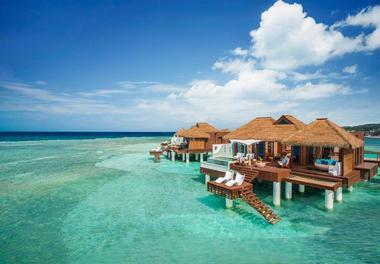 This resort is very popular with honeymooners and couples who are looking for a memorable romantic getaway. If you are looking for a romantic couples’ getaway or a luxurious spot to spend your honeymoon, check out Couples Swept Away in Negril. 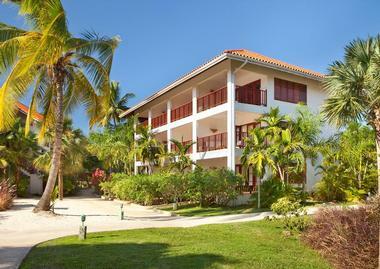 This fun and luxurious beach resort offers 312 suites inside bungalow-style buildings. Romantic experiences are at every turn, with options like private beach dining and couples’ massages. For the more active and adventurous couples, there are exciting activities on offer at the resort, such as taking a ride in the resort’s party bus and water skiing. The resort has two outdoor pools, four hot tubs, a clothing-optional beach, four restaurants, and two bars, giving you plenty of spaces to explore and experience during your vacation. 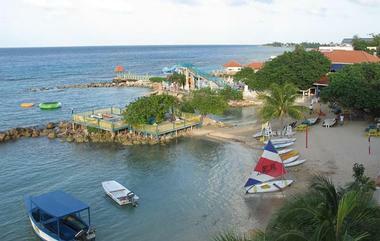 Couples Tower Isle is one of the first resorts to have been built in Jamaica. It was a favorite among Hollywood stars in the 1950s, who came to enjoy the luxury resort and its beautiful location. While the rooms could use an upgrade, the resort has done a good job in keeping the common areas up to date, so it is still a formidable option when looking for an all-inclusive in Ocho Rios. 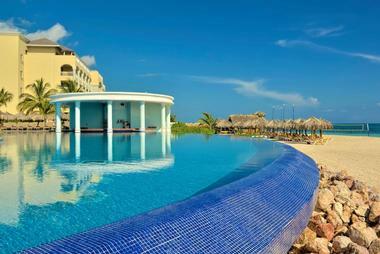 They have decent swimming pools that are within sight of the ocean, one of which offers a swim-up bar. The spa is fantastic and offers a full range of services. The resort is adults-only, so you won’t have to worry about being woken up by the pitter-patter of little feet during your stay. If you plan to bring the kids along on vacation, our list of resorts may leave you feeling as if your options in Jamaica are limited. 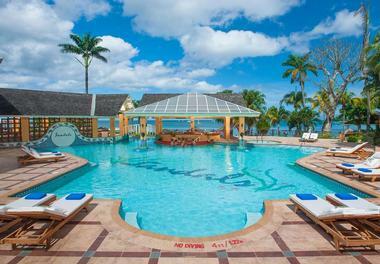 However, that need not be an issue when resorts like the Franklyn D. Resort & Spa are on offer. This kid-friendly, all-inclusive resort even has a personal nanny included in the price, which leaves mom and dad free to truly enjoy their vacation and take in the spa, indulge in a meal at one of the delicious, adult-focused restaurants, or enjoy the beachfront. Your kids will be asking to come here again and again, with the 100-foot water slide named Big Blue, glass-bottom boat rides, swimming pools, fishing, cooking classes, snorkeling, and a kid-focused buffet, just some of the family-friendly amenities this property has available. 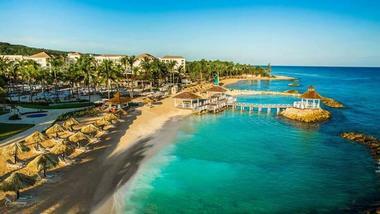 The Hilton Rose Hall Resort and Spa is set on a private beach on a former sugar plantation in Montego Bay. The ritzy resort offers luxurious rooms with balconies and ample amenities. Some rooms have sea views, and suites with separate living areas and kitchens are available. 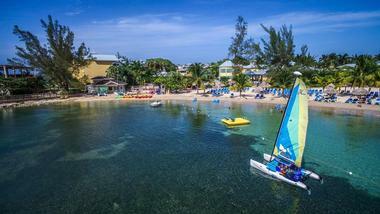 Resort guests have access to the hotel shuttle, a variety of water sports, and free-flow food and beverages. The property has four delicious restaurants and two bars to indulge in a variety of food and beverage options during your stay. 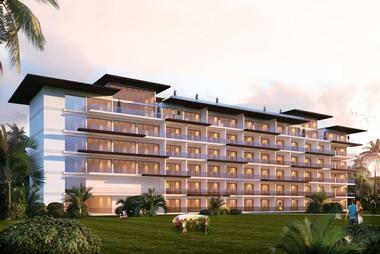 There is a pool, kids club, spa, jogging track, fitness center, golf course, and several tennis courts as well. Hotel Riu Palace Jamaica is an adults-only, all-inclusive hotel near the iconic Georgian mansion, Rose Hall. The resort property offers modern accommodations with standard resort amenities as well as balconies or terraces for each room. The property also offers suites with separate living areas and whirlpool tubs. Several restaurants offer Italian, Japanese, and other international fare and there are also a steakhouse and a sports bar. There are three infinity pools available, two of which have swim-up bars. Other amenities include a fitness center, spa, and a variety of water sports. Live music is often scheduled and only enhances the already fun atmosphere. 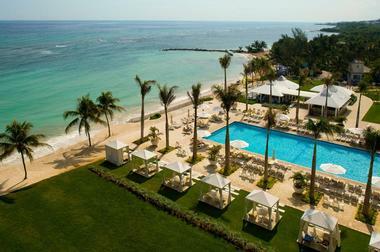 The Hyatt Ziva Rose Hall is half of a beachfront complex on Montego Bay comprising this resort and its sister resort next door – the Hyatt Zilara Rose Hall. The resort has an especially impressive list of amenities, which includes a family-friendly beach, a clean and spacious pool, eight on-site restaurants, and a spa with sauna and steam room. The property has 387 guest rooms, which include a mix of updated and older rooms. The Hyatt Ziva Rose Hall is the family-friendly side of the resort complex, with the other half being adult-only, giving guests a great deal of flexibility in choosing an experience that works well for their group. The Iberostar Rose Hall Suites Montego Bay is tucked between the mountain and the sea just a few miles away from Montego Bay. There are both oceanfront and ocean view suites as well as two ultra-posh presidential suites. There are four onsite restaurants and two buffets that offer local Jamaican and international fare, so you can sample a variety of food to your heart’s content. The resort offers a wide variety of classes for active travelers, such as tai chi, yoga, pilates, dance lessons, and windsurfing. If you’d prefer to have a more relaxed vacation or just need to chill out after a day of excitement, the resort also has a golf course and luxury spa. This sprawling, all-inclusive resort is located on a stretch of Seven Mile Beach in Negril. The resort offers airy, modern rooms with amenities such as Wi-Fi, smart TVs, and gaming consoles as well as traditional hotel amenities such as mini fridges and coffeemakers. Some have balconies and marble tubs. For added luxury, book a suite with a living room, a stocked mini bar, and a butler to attend to your needs. Food and drinks at the resort’s nine restaurants and six bars are included, as is access to the resort’s water park, dive center, luxury spa, nightclub, kids club, golf course, pools and, of course, the beach. If you are looking to run away from your daily life for a while, then this resort in aptly named Runaway Bay may be just what you are looking for. Jewel Paradise Cove Resort & Spa is an adults-only oceanfront property with a butler service in the suites. The resort offers healthy dining options and unique, local Caribbean food as well as international options at both casual and formal restaurants. There are seemingly endless activities and amenities available, including a luxurious spa, scuba diving, sailing, golf, and relaxing on the gorgeous beach and enjoying the surroundings. They even have dive-in movie showings each week at the resort’s pool. 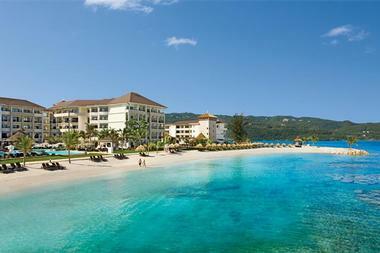 Moon Palace Jamaica Grande is a huge, sprawling property located near the city center of Ocho Rios. The resort has more than 700 beautiful and luxurious rooms. They offer accommodations for families in their family deluxe suites. However, if you are traveling as a couple, they also have romantic ocean-view rooms for two. There are several delicious dining options with a range of international fare available at five onsite restaurants and six bars, including a swanky piano bar. Additionally, the resort has a spa to help you recover from days spent exploring the downtown area around the hotel or playing on the beach. The Negril Tree House Resort is an understated low-rise property located on Negril Beach, just a short distance from the Negril Aerodrome, downtown Negril, and Kool Runnings Waterpark. The property has fresh, bright, and airy rooms that are quite spacious and feature minimalist decor and standard amenities. Traditional guest rooms and suites with multiple bedrooms and kitchenettes are both on offer. The property has a delicious complimentary breakfast bar as well as a restaurant that serves both traditional Jamaican food and Chinese cuisine. There are beautiful gardens on the property, and water sports such as snorkeling and windsurfing are available to resort guests. This property is perfect for those who are interested in a resort with a bit of a historical background. It is set at the location of a former sugarcane plantation. 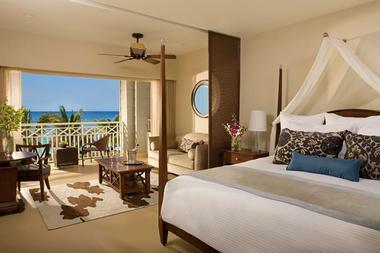 The resort’s rooms were designed by Ralph Lauren and feature ocean views, four-poster beds, and modern amenities. There are stylish villas with two to six bedrooms, which are perfect for families and groups. The property has a beautiful spa and yoga classes are available, which are both great ways to unwind after a long day water-skiing, windsurfing, and enjoying the beach. Delicious cuisine is guaranteed with themed dining nights, private dining options, and meal plans all featuring fresh produce from the resort’s very own garden. 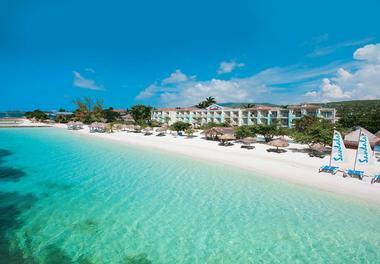 Sandals Montego Bay is a more laidback resort than many of the upscale places on our list, but that doesn’t mean you shouldn’t expect a luxury experience. This couple’s only property is located on what many consider to be the best private beach in Montego Bay and features oceanfront, beachfront, and ocean-view suites, so you can fully enjoy the white sand views. The sea is calm as a natural reef prevents the water near the shore from getting too rough. There are nine delicious restaurants at the resort as well as a large variety of evening entertainment, such as live bands, an amphitheater, theme nights, and more. 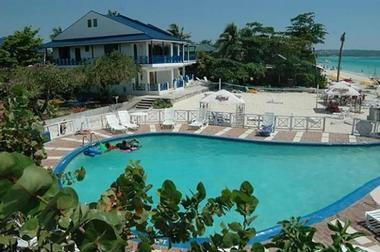 This upscale resort is located on Seven Mile beach in Negril. The result is perfect for fun-loving guests who are looking for an exotic retreat. Options for accommodations include luxurious rooms with private pools or soaking tubs as well as traditional British colonial-style rooms in the main resort. Your taste buds will delight in the cuisine on offer at seven different restaurants, ranging from Italian to traditional Jamaican cuisine and everything in between. Each evening has a different theme with regard to entertainment, which means that your nights will never be boring. If you can convince yourself to leave the beautiful resort, the Xtabi caves are only a short distance away and are popular with tourists. True to their reputation, this Sandals property in Montego Bay can be counted on to deliver a traditional, all-inclusive resort experience. The sleek, modern property gives off a cool and chic vibe. The room options include overwater villas, so you can step straight out into the ocean each morning or watch beautiful tropical fish swim in the clear water as you enjoy your breakfast each day. This property is well known for its personal butlers, sunset tours aboard catamarans, and a delectable champagne and caviar bar. 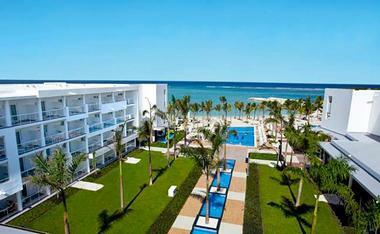 The resort is truly all-inclusive and never charges extra for any excursions, meals, or extras, including scuba diving. If you are looking for an exclusive, luxury resort that is completely private and away from it all, Sandals Royal Plantation could be your new favorite vacation destination. The all-butler resort is located in Ocho Rios and features only 74 ocean-view villas nestled on a beautiful coral bluff. The property has plenty of activities and amenities to keep you feeling entertained and pampered, from golf courses to pools and beautiful beaches, all with butlers to bring you drinks and snacks, to five different restaurants that mean you will never get bored of the food. There is also a Caribbean-themed spa and wellness center to keep you relaxed and in shape during your getaway. For those who feel that even a beachfront villa isn’t close enough to the beach, Sandals South Coast offers an amazing room option with exclusive over-the-water bungalows. Spend your vacation as close to the gorgeous clear blue water and beautiful fish as possible in one of these stunning rooms, or opt for a more affordable, but still luxurious, room in the European-themed villages in the main resort. The resort offers nine restaurants and seven bars for an array of food and beverage options to choose from. There is nightly entertainment including parties, live shows, theme nights, and bands. 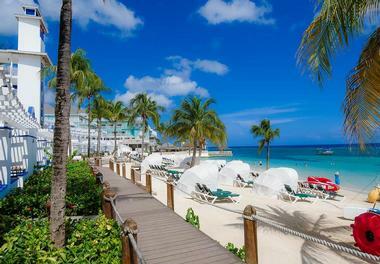 Secrets St. James Montego Bay is located on an isolated peninsula that overlooks the Caribbean Sea. The property is luxurious, adults-only, and all-inclusive with access to bars and restaurants nearby for those who wish to venture outside the resort property. Guest rooms have British colonial decor, furnished balconies, and views of the ocean. The property has nine restaurants, eight bars, and a coffee shop. Two outdoor pools feature swim-up bars. There is also a full-service spa, an exercise room, and water sports equipment available. Guests can also take part in fitness classes, bicycle tours, and scuba diving. 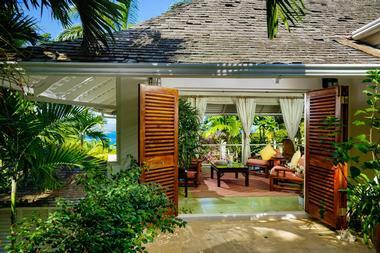 On a mile of private beachfront on a peninsula in beautiful Montego Bay sits the luxe Secret Wild Orchid. The beautiful beachfront resort offers the experience of white sandy beaches and clear blue water that Jamaica is known for, just outside the front doors of the hotel. Experience decadent accommodations with one of 350 colonial guest suites, which each have private whirlpool tubs and balconies. There is a range of international cuisine served up daily at seven on-site restaurants. Dine any hour of the day with the 24-hour World Cafe as well as room service. Activities available include windsurfing, snorkeling, and relaxing on the beach, among many others. Sunset At The Palms is an adults-only, all-inclusive resort situated at the northern end of Seven Mile Beach in Negril. The resort is perfect for visitors who want to experience the wilder side of Jamaica. The rooms are treehouses, which means that you can get up close and personal with nature. 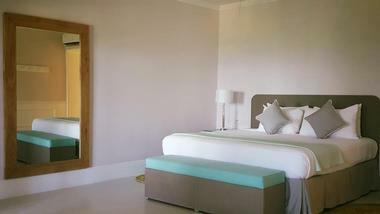 Each room also has the option of being open air but can also be closed off and air-conditioned if you prefer. With the property being strictly adults-only, it is perfect for couples looking for a romantic getaway. 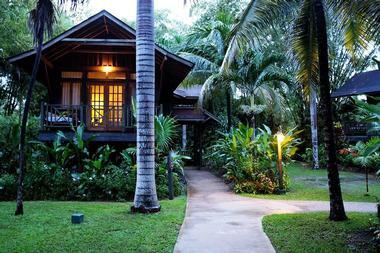 There are several activities for couples, including cooking classes, or guided nature walks in the tropical gardens. The Caves somehow combines both world-class luxury and rustic touches, which encourages guests to relax and unwind while, at the same time, they are treated like royalty. 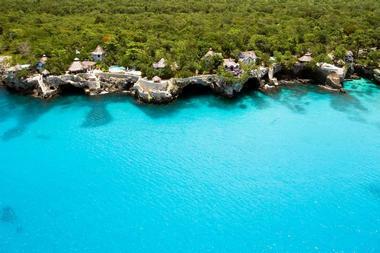 The resort features cliffside cottages and is best known for their very attentive service staff. You will not be ignored at this hotel, rather, the staff are trained and willing to do everything they can to make your stay comfortable and enjoyable. The hotel has a praiseworthy restaurant serving fresh and mostly healthy food. For those who enjoy having a few drinks, each room comes with a bottle of Caribbean rum and there is a fantastic bar that is built into an actual natural cave. Those looking for a thrill will love the adrenaline rush of jumping from the resort’s numerous cliffs right into the sea below.